In order to run the SICM code, you need to install the scmutils library. Just go to the official page to download the library and follow the official instructions to install it in a Linux operating system. If so, you should install the program xterm first. Replace ROOT with the directory in which you installed the scmutils software. (Remember to replace it in both places. If it is installed differently on your system, just make sure the string has the form “/path/to/mit-scheme --library /path/to/scmutils-library“.) Restart emacs (or use C-x C-e to evaluate the mechanics defun), and launch the environment with the command M-x mechanics. We have used the variational principle to determine if a given trajectory is realizable. We can also use the variational principle to find trajectories. Given a set of trajectories that are specified by a finite number of parameters, we can search the parameter space looking for the trajectory in the set that best approximates the real trajectory by finding one that minimizes the action. By choosing a good set of approximating functions we can get arbitrarily close to the real trajectory. We have used the variational principle to determine if a given trajectory is realizable. Check if the action of that given trajectory is stationary or not. The function takes a coordinate path; the function takes a configuration path. makes a procedure that represents a function of one argument that has no known properties other than the given symbolic name. The method of computing the action from the coordinate representation of a Lagrangian and a coordinate path does not depend on the coordinate system. The set of all configurations of the system that can be assumed is called the configuration space of the system. In order to be able to talk about specific configurations we need to have a set of parameters that label the configurations. The parameters used to specify the configuration of the system are called the generalized coordinates. The -dimensional configuration space can be parameterized by choosing a coordinate function that maps elements of the configuration space to -tuples of real numbers. The motion of the system can be described by a configuration path mapping time to configuration-space points. Corresponding to the configuration path is a coordinate path mapping time to tuples of generalized coordinates. The function takes the coordinate-free local tuple and gives a coordinate representation as a tuple of the time, the value of the coordinate path function at that time, and the values of as many derivatives of the coordinate path function as are needed. Common Lisp provides a spectrum of predicates for testing for equality of two objects: eq (the most specific), eql, equal, and equalp (the most general). eq and equal have the meanings traditional in Lisp. eql was added because it is frequently needed, and equalp was added primarily in order to have a version of equal that would ignore type differences when comparing numbers and case differences when comparing characters. If two objects satisfy any one of these equality predicates, then they also satisfy all those that are more general. The predicate eql is the same as eq, except that if the arguments are characters or numbers of the same type then their values are compared. Thus eql tells whether two objects are conceptually the same, whereas eq tells whether two objects are implementationally identical. It is for this reason that eql, not eq, is the default comparison predicate for the sequence functions defined in chapter 14. The eql predicate is true if its arguments are eq, or if they are numbers of the same type with the same value, or if they are character objects that represent the same character. The equal predicate is true if its arguments are structurally similar (isomorphic) objects. A rough rule of thumb is that two objects are equal if and only if their printed representations are the same. Numbers and characters are compared as for eql. Symbols are compared as for eq. This method of comparing symbols can violate the rule of thumb for equal and printed representations, but only in the infrequently occurring case of two distinct symbols with the same print name. Two objects are equalp if they are equal; if they are characters and satisfy char-equal, which ignores alphabetic case and certain other attributes of characters; if they are numbers and have the same numerical value, even if they are of different types; or if they have components that are all equalp. — Guy L. Steele Jr.
— Conrad Barski, M. D.
Clasp is a new Common Lisp implementation that seamlessly interoperates with C++ libraries and programs using LLVM for compilation to native code. This allows Clasp to take advantage of a vast array of preexisting libraries and programs, such as out of the scientific computing ecosystem. Embedding them in a Common Lisp environment allows you to make use of rapid prototyping, incremental development, and other capabilities that make it a powerful language. The step 2 is to “build cross-compiled ECL for Android”. It should have been straightforward to follow the instructions in the README page of the EQL5-Android project. The error was caused by the fact that my Ubuntu 18.04’s 64-bit gcc toolchain could not compile any source code to create 32-bit executables. A more serious problem was that I could not even locate the error log file config.log. the directory build was actually not created at all. So I manually created that directory before running the command ./1-make-ecl-host.sh again. Only then, I could find the error log file config.log in the build directory, after the failure of the compilation. After installing the Android SDK Tools by installing Android Studio, originally, you would be able to install the Android NDK through Android Studio’s SDK Manager. However, since EQL5-Android requires an old version of the NDK (version 10e), you have to download the NDK from the Android’s official NDK webpage. In Ubuntu, move the file android-ndk-r10e-linux-x86_64.zip to the same location as the Android SDK and then unzip it. The first step to set up EQL5-Android is to install Qt. 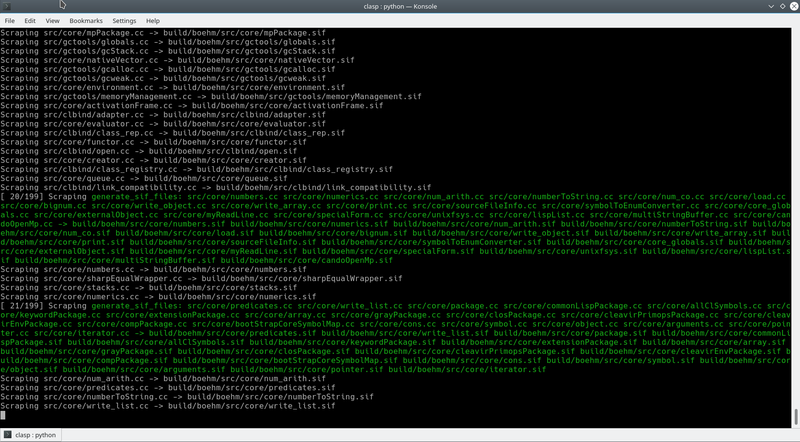 In Ubuntu, if you do not need the most updated Qt, you can just install the Qt-Creator using apt-get. An REPL called “CL REPL” is available in the Google Play Store. But itself is not for developing standalone Android apps, unless those apps are Common Lisp source code files only. However, “CL REPL” itself is an open source GUI app using Common Lisp and Qt. So by learning and using its source, in principle, we can create other Android apps using Common Lisp with Qt. The library that “CL REPL” uses is EQL5-Android. Defining the defmacro function using only LISP primitives? How would you define the defmacro function using only these primitives in the LISP of your choice? Every macro in Lisp is just a symbol bound to a lambda with a little flag set somewhere, somehow, that eval checks and that, if set, causes eval to call the lambda at macro expansion time and substitute the form with its return value. If you look at the defmacro macro itself, you can see that all it’s doing is rearranging things so you get a def of a var to have a fn as its value, and then a call to .setMacro on that var, just like core.clj is doing on defmacro itself, manually, since it doesn’t have defmacro to use to define defmacro yet. A formal description of what macros do would be long and confusing. Experienced programmers do not carry such a description in their heads anyway. It’s more convenient to remember what defmacro does by imagining how it would be defined. The definition in Figure 7.6 gives a fairly accurate impression of what macros do, but like any sketch it is incomplete. It wouldn’t handle the &whole keyword properly. And what defmacro really stores as the macro-function of its first argument is a function of two arguments: the macro call, and the lexical environment in which it occurs. we will get an error. The function COMMON-LISP-USER::SQ is undefined.